Ali (Christina Aguilera) is a small-town girl dreaming of making it in Los Angeles and sets out to make it a reality. In the City of Angels she discovers The Burlesque Lounge, a struggling club run by the formidable burlesque star, Tess (Cher). 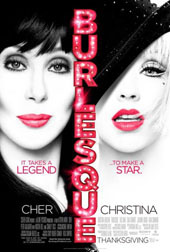 In case you hadn't worked it out, from concept to execution, Burlesque is incredibly clichÃ©d. As soon as it started I knew where it was going to end. However, it wasn't nearly as painful as it could have been, though I'm not sure that's a good enough reason to rush out and see this musical. Steven Antin has a lot to answer for here: not only did he direct this film, but he also wrote it, and his screenplay is pretty abysmal. This is the type of film that you can accurately predict what each character will say or do in certain situations before it has happened. The film loses it way many times, switching from drama, to comedy, and back, and the whole thing fees overblown. It's not helped by the overly long period of musical numbers in the middle of the film. There's also no explanation of who the characters were, and how they were involved with each other. I genuinely had no idea who Vince (Peter Gallagher) was in relation to everyone else, for instance, and only worked it out once I had read the synopsis after leaving the cinema (hint: he is Tess's ex-husband). Being a fan of the theatricality of burlesque shows I found myself let down by the music and accompanying dance routines as they more closely resembled cabaret acts than burlesque. This does make the name of the film somewhat misleading, though of course they couldn't call it Cabaret, if only because it pales in comparison to Bob Fosse's film. Ultimately the songs were disappointing and the numbers with high production values that were enjoyable had little connection to the story, making me wonder why they were included in the film. The conclusion I came to was that this film was being used to showcase Aguilera's impressive voice if not her (limited) acting ability. The one saving grace for this film is that it's almost so bad it's good, in that once you've accepted that you can have a good laugh at it, not with it. 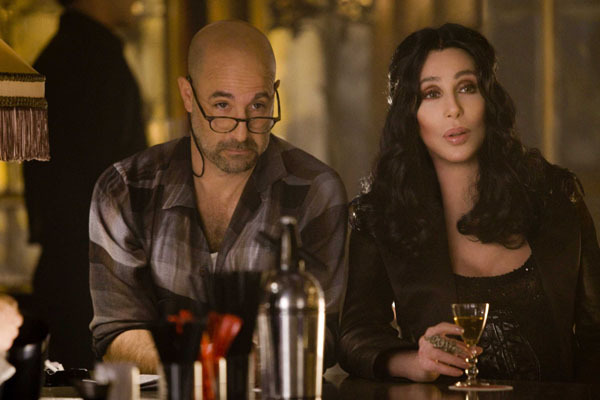 The clunky writing and the acting can all be ignored and you can spend your time admiring Jack's (Can Gigandet) arms and body, or marvelling at the fact that Cher's face does not move, or even that she has an amazing body for someone who is 64. It doesn't make it a good film, but it will help you to get through the two hours of your life that you'll be giving up to see it. I went into the cinema having seen the trailer and I expected to see the worst film ever, but surprisingly it isn't. However, the only people I would recommend this film to are those people who enjoy watching, and laughing at, clichÃ©d films about a small-town girl making it in the big city (i.e. Coyote Ugly). Ultimately this is a bad film and I am genuinely surprised that it was nominated for a Golden GlobeÂ® in the 'Best Motion Picture - Comedy Or Musical' category [ed - Given that the other nominees include Alice in Wonderland, Red and The Tourist, apparently there just wasn't anything award worthy this year...]. Although having said that, I did spend a lot of time throughout the film laughing at it, so maybe they just got confused and thought it was a comedy! ?